Managing Director, Atlantic Shrimpers Limited, Kamlesh Kabra (left); Officer, Notary Public, Bankole Animashaun; Executive Director/Chief Executive Officer, Nigerian Export Promotion Council (NEPC), Olusegun Awolowo; and the Commissioner for Agriculture, Lagos State Ministry of Agriculture, Suara Isiaka Oluwatoyin, during the inauguration of Atlantic Shrimp farm, in Badagry, Lagos. The Federal Ministry of Agriculture and Rural Development (FMARD) has concluded plans to increase its support and commitment to boost fish production in the country, noting that fish business is a venture with a lot of potential investment opportunities in the country. The Permanent Secretary Federal Ministry of Agriculture, Dr. Shehu Ahmed, explained that fish farming is a veritable tool for increased fish production and alleviation of poverty for sustainable livelihood and achieving food security in Nigeria. According to him, fish is the highly traded commodity in the world, saying that it is on this premise his ministry is promoting increased fish production through aquaculture and shrimp value chains. He added that the value chains will create an enabling environment for increased and sustainable production of aquaculture and generate employment for the nation’s teeming population. 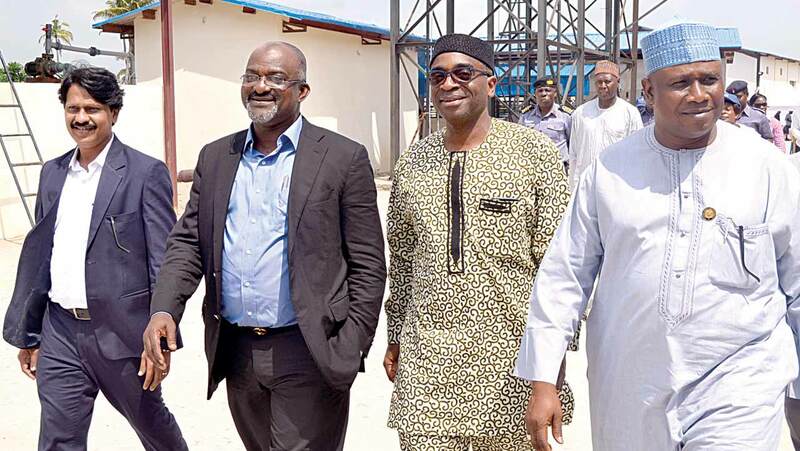 The permanent secretary during the opening ceremony of Atlantic Shrimpers Limited (ASL), shrimp farm in Badagry, Lagos, said successive governments have continued to recognize the strategic role of agriculture in national economic development so as to provide adequate food for a growing population, supply adequate raw materials, expand the market for agro allied products, create employment opportunities, increase foreign exchange earnings and diversifying its economic revenue base. He however lauded ASL for its investment in shrimp production, saying that the firm is playing a commendable role strengthening the agribusiness space in Nigeria through the rational exploitation and export of non-oil products. “This farm has played a commendable role not only in the area of export of fish, but opening these areas for development and job creation,” he said. He added that the current administration’s approach to repositioning the agricultural sub sector for growth is to apply its agricultural roadmap to achieve self sufficiency in food production, enterprise promotion, productive employment and wealth generation for the country, maintaining that this move is to address the challenge of a growing population, declining revenue and the attendant austerity biting harder day by day. Also speaking at the event, the Chief Executive Officer, Nigerian Export Promotion Council (NEPC), Segun Awolowo, said the Ministry of Agriculture and Rural Development is working on the certification for export to the European Union (EU), pointing out that the ministry is at its final stage to completing the move. “We will be working with the government of the Netherlands to help fast-track non-oil export from Nigeria to the EU so that all those rejects we get, the backlogs and the challenges we face exporting to the EU will be addressed. The most important thing is to build capacities of our exporters to be export ready, because most of the industries in Nigeria are not export orientated and for us to get out of the recession is by earning foreign exchange in a sustainable way which is boosting export of our non-oil products,” he added. He said the council is working with the United Nations Development Organization (UNIDO) and the International Training Fund (ITF) to have a skills gap survey in order to bridge the skills gap in the country. He said in terms of non-oil export so far this year, Nigeria has not done so good, saying that non-oil export figures declined from $3 billion two years ago to $1.6 billion, owing to the low price of oil and the inactive Export Expansion Grant (EEG). The Chairman, ASL, Stewart Harper, commended the State and Federal government for support the company has received so far, stating that this kind of investment is the first step for Nigeria to export.He pointed out that with its state-of-the-art shrimp farm, it will be creating jobs to over 1300 people in the country, saying that Nigeria cannot afford to rely on the ocean forever, but also depend on its land to drive economic growth and Foreign Direct Investments (FDIs). “We get a lot of help from the State government and also from the federal government. The government is doing what it can do. Getting the certification we need to export products to the EU is very important and we believe hard work is currently being done towards this direction. We should be able to get our products into the EU because it is a big market,” he said.